These extracts are written by Late Shri Hari Vinayak Sathi in Sai Leela Magazine published in 1923. One of my relative was a lawyer in High Court. Once he went to Shirdi for Baba’s darshan. It was his first trip to Shirdi. One day, it so happened that Baba and my relative were all alone in Dwarkamai, Baba said to him, “What to say, Shri Ram Jai Ram, Jai Jai Ram”. After two minutes Baba again repeated His words. The gentleman then understood that we should mutter only that mantra which our Guru had given us. It was Baba’s practice to give signs or remark to His devotees worship or belief in order to make it firm.Once in Wada, two of my relatives were criticizing others in someway or others. I was feeling sleepy and so I went to sleep. They were talking till 2 at night. At last they realised that whatever they were doing was wrong. So one of them said, “We have criticized much, we should stop now and go to sleep". Next day along with other devotees they went for darshan of Baba. When they both bowed to Baba, He said, “Many types of people, good, bad or ill-hearted, come to Our darbar, but why should we criticize anyone?” My relatives understood Baba’s hint and took the lesson that we should not criticize anybody. Baba’s teachings were many times in incomplete sentences. It was not possible that one can know the importance of His words immediately. Many times it so happened that after few months or years, such a situation arose that one could understand His incomplete sentences. Those incomplete sentences would then act as “Ram Ban” (as Lord Ram’s arrow never failed its target, so were Baba’s words). At that time, Baba’s words would come in front of one’s eyes and proved very useful. The following incident makes this clear. Once two gentlemen, who were friends from many years, had some difference of opinion. It so happened that one gentleman, at whose house another gentleman had visited, spoke some words, that the other gentleman felt insulted. He at once left his friend’s place. He even returned back his friend’s book through a third person and even took back his books also through the same person. As those gentlemen were my friends also, this incident came to my ears. At that time, I remembered two sentences said by Baba many years back. As both of my friends had firm faith in Baba. I told one sentence to one of them and the other sentence to my other friend. By hearing those sentences, there was a miracle that their misunderstanding and anger disappeared and both of them became friends again. I said to the gentleman who had insulted his friend, a sentence said by Baba that, “If you don’t speak good of anybody, it’s ok. But do not say bad of others. I am hurt because of it.” By this he realised that he not only hurt his own friend, but he had hurt Baba also.” So we must not speak ill of others. We must remember that Sai Baba is in every being. So if we hurt someone, it is equal to hurting Sai Baba.The second sentence which Baba said meant that we are such people, that even if we quarrel or even if we insult each other, then also we are not separated. So the gentleman took the lesson that if my old friend has said me something or even if he had insulted him, why should I cut off all the relations? Even I called back my book, which was very inappropriate behaviour of mine. Now Baba won’t forget my behaviour. So both the friends repented for their deeds, forgive each other and become good friends again and remained in that way forever. 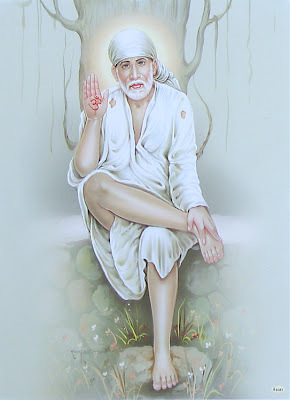 Sai Baba said,"Let anybody speak hundreds of things against you, do not resent by giving any bitter reply. If you tolerate such things you will certainly be happy. Let the world go topsy-turvy, you remain where you are".